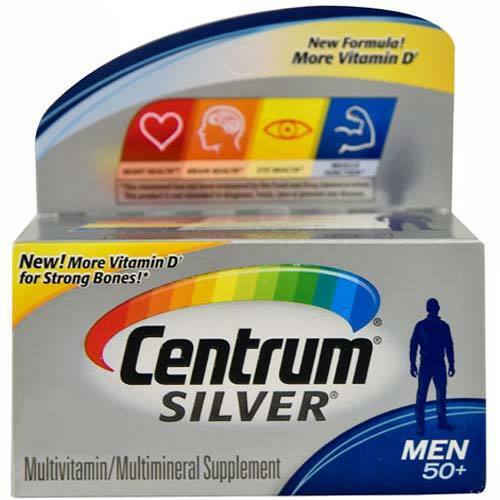 Silver Men's 50 + Multivitamin from Centrum provides 120 mg of Vitamin C in each serving! The customer reviews posted below are based on individual consumer experiences and may NOT necessarily represent what expected results will be from using or taking Centrum Silver Men's 50 + Plus Multivitamin - 100 Tablets. These results may not be typical and you should not necessarily expect to receive the same results. Actual results may vary. Vitamin E is excellent, improves mood and immunity. Besides coming in a very beautiful and practical packaging. I recommend it to everyone. Well worth it. A must have in every house-hold. A compact bottle that you can carry around even when you are trips or to where ever you go. This supplement takes care of my daily dose of vitamins, and having 100 tabs in one pack, last for three months. I also think this is a bargain price. I only with I had found this years ago. Good stuff. Excellent communication! Very recommend!